While the experiment had a good outcome, this was a small test in my own garden. I'd be interested to hear results from your gardens, too. 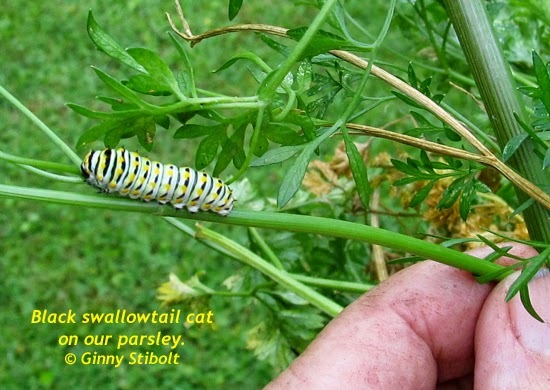 My husband found a small black swallowtail caterpillar on the parsley as he was pulling it. 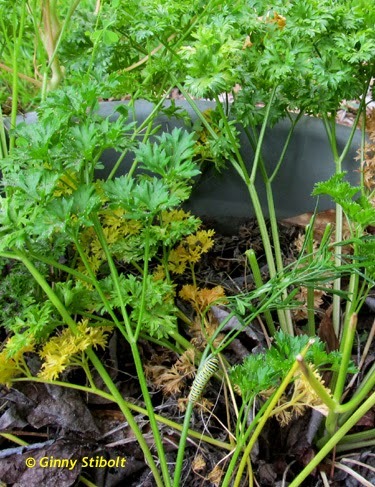 Fortunately, I had planted some parsley in a pot and had only pulled out the one plant that had bolted. We transferred the cat to its new location. We hope it survives. Also we had enough parsley for one last batch of tabbouleh. It's what's for dinner tonight—and the next couple of nights, too! We found a small black swallowtail butterfly on our parsley as we were pulling it out. Fortunately we hadn't pulled the parsley in a pot. 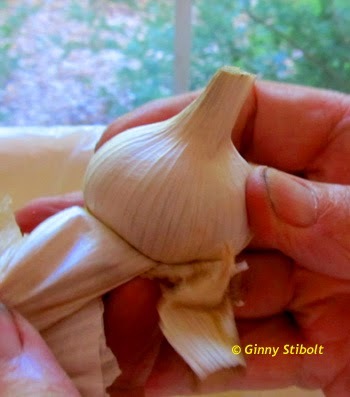 I had harvested the garlic a couple of weeks ago and had hung it in the garage to dry. This week my husband cut off the leaves and roots and pulled off the papery outside layers of the bulbs. Both the hanging and this cleaning process prolong the shelf life. 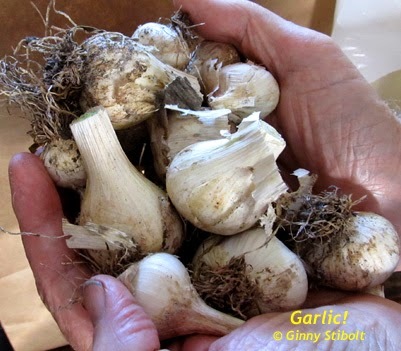 The garlic bulbs are now stored in a paper bag in the bottom of the pantry—a cool, dry, and dark place. The top of the bag is folded over and held in place with a clothes pin. The onions are also stored here. In a few weeks we'll go through the bags and pull out any bulbs that have softened or sprouted. The onion harvest should last us a few months, but the garlic will last us longer than that. It's been a very good year. Oooh garlic. Cleaning up the bulbs. A salad harvest plus some okra. 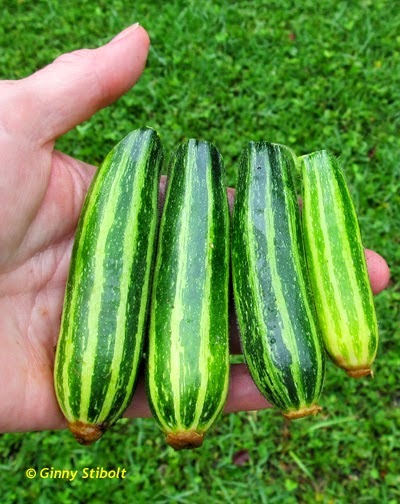 We harvest the unfertilized zucchinis as soon as we know that they are not going to grow. The lettuce has gone by, so we are using store-bought lettuce after a winter & spring of beautiful fresh-out-of-the-garden lettuces. 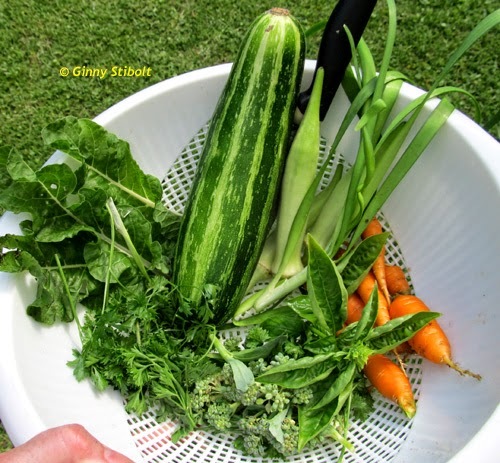 The salad harvest in the above photo includes some Swiss chard, parsley, the last of the come-again broccoli, basil, rosemary, oregano, garlic chives and the last of the carrots. I also picked the okra, but that was saved for some other use. So I used half of the zucchini, 3 previously-harvest cabbage leaves and the remainder of this harvest along with a few leafy green lettuce leaves from the store, for a lovely crunchy salad. We've been having fun with out tiger zucchinis. They change how we cook while they are in season. Squash flowers (zucchinis and otherwise) have male and female flowers. The female flowers have little pre-formed fruit under them. If the flower has been visited by at least 8 or 9 pollinators, it will start to grow, but sometimes that doesn't happen—too much rain, not enough male flowers in bloom, or not enough pollinators—the fruit does not grow and the blossom end starts to turn yellow. I look for these undeveloped fruits and use them wherever we'd use the fully formed ones. If the unfertilized fruits are left in place, they will rot, so it's good practice to remove them. 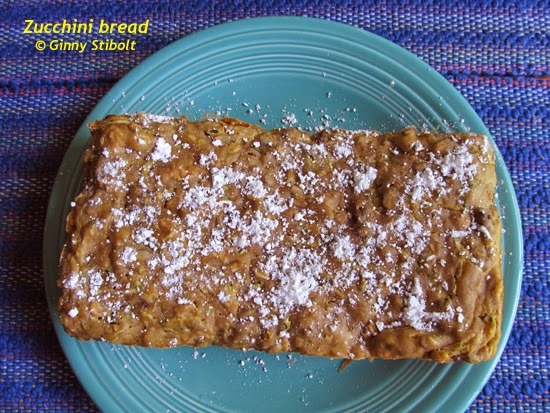 We've been enjoying the yummy zucchini bread. Bottoms up! 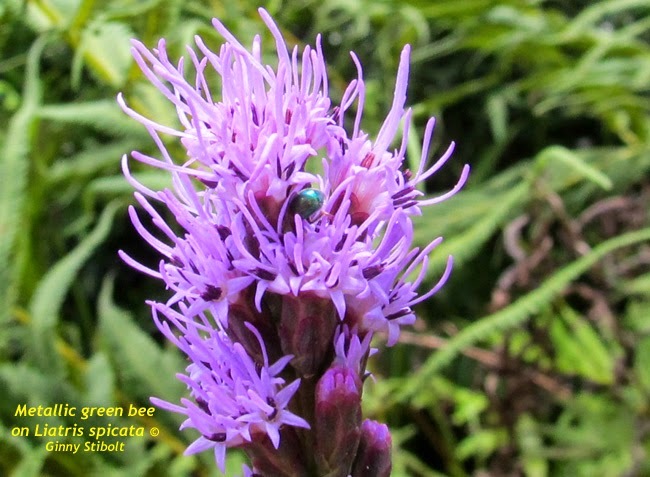 Small native bees go crazy in our blazing stars and seemingly never come up for air. Yummy blackberries in the front meadow. Yucky trash in the front meadow. It looks like Halloween candy. The other day I was out in out front meadow removing some small trees and trimming low-hanging branches from the path. (See From lawn to woods: a retrospective for details on this area.) 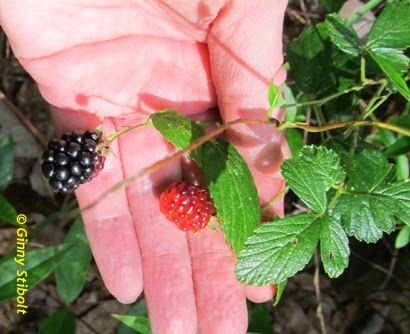 I rewarded myself with some of the blackberries that have grown out there, which was nice. 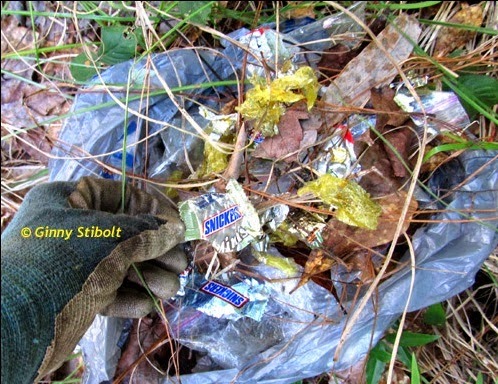 I also found an old bag of Halloween candy that someone had thrown into the meadow over the fence. The animals had worked it over and all that was left were the foil wrappers and plastic bag, which was not so nice. I also built up an area at our end of the pond to replant some Dixie irises I'd removed when we treated the pond with herbicide to get rid of the infestation of water spangles. (More on the pond later.) 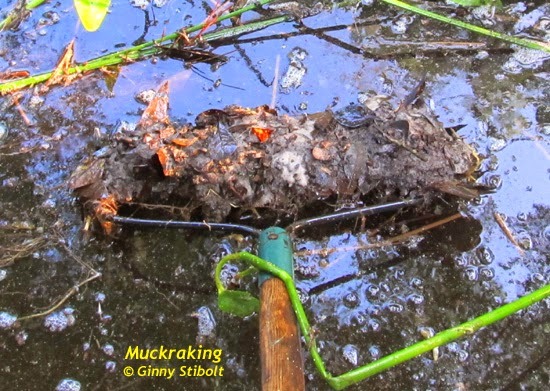 I used an iron rake to gather muck and sand from the bottom, piled into a mound and compressed it with the rake and my foot. I hope the irises grow roots quickly to keep the mound in place, otherwise it will slump into the bottom again. The wet season in Florida (June through November) means great clouds. 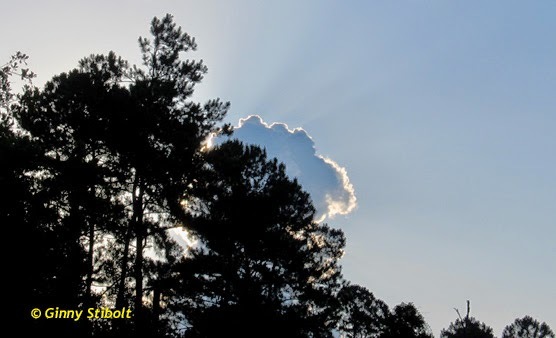 I saw this is a morning thunderhead on my morning walk a couple of days ago. The summer solstice is tomorrow. I'll be celebrating the official change of seasons out in my gardens, but of course it's been pretty summery here in north Florida for a while. Happy summer. When did you do the cover crop of marigolds - in the winter? I'm in central Florida. We've had a problem with nematodes even in containers. 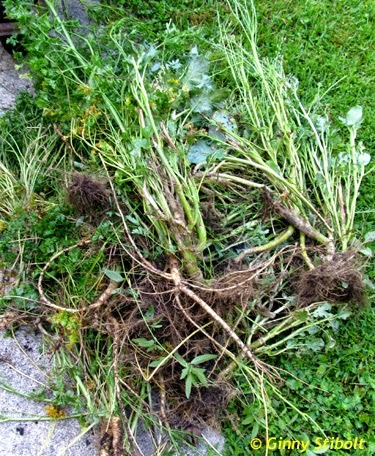 This year we moved to beds but when I pulled up dying cukes, the roots looked like nematode damage. I still have my tomatoes so I don't know what their roots look like yet. I have marigolds and other companion herbs and flowers, so very little pest problems, but this is Florida so hard to ignore the nematodes.